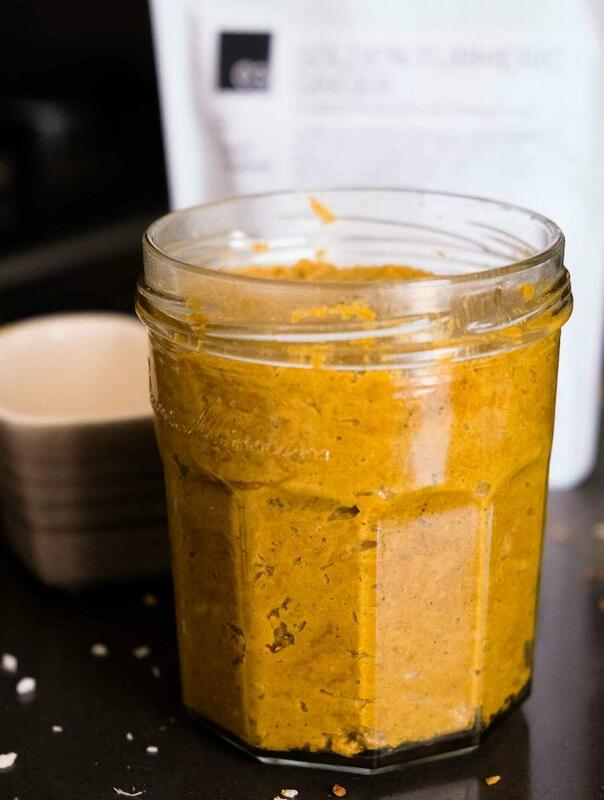 A golden nut butter made with turmeric, cashews, shredded coconut, pumpkin seeds, and love. 1Toast cashews and pumpkin seeds in a pan over low heat for 6-8 minutes. Stir occasionally to even the browning. 2Remove pan from heat and mix in shredded coconut. 3Transfer cashews, pumpkin seeds, and shredded coconut into the container of the blender/food processor. Add the turmeric latte mix. I used the single serve container from my Ninja blender to avoid having to scrape the sides of the container as often. 4Blend or pulse until desired consistency is reached. The longer the nut butter is blended for, the more liquid-like the consistency will be. 5Transfer the nut butter into an air tight container. Add maple syrup and vanilla extract (both optional) and hand mix into the nut butter. 6Spread nut butter and love! I blended my nut butter for roughly 8 minutes on and off, as I was afraid my Ninja blender would overheat. If you have a Vitamix or a higher powered blender/food processor, it could take you as little as 3 minutes to reach desired consistency.